Since its release last night, I've been playing the latest Five Nights at Freddy's non-stop. Here's what I've gathered, ranging from how the game works, to the secrets players have found hidden within. When you start the game up, you get a message from a skater dude who tells you all about your miserable new job. Basically, the game takes place 30 years after Five Nights at Freddy's 1, when most people have forgotten about the pizza establishment with fucked-up Chuck-E-Cheese wannabe animals. The few people that do remember Freddy Fazbear's Pizza thought it would be a good idea to make a horror attraction based on the urban legend. These people try their best to get the animatronics from the first two games, but they don't manage to find much for their haunted house. The attraction opens in a week, so we have to make sure everything works, and nothing catches on fire! When the place opens people will come in from the opposite end of the building, and work their way toward you and past you, and out the exit. Uh, yeah you've officially become part of the attraction! You'll be starring as...the security guard! So not only will you be monitoring the people on the cameras as they pass through, you know, to make sure nobody steals anything or makes out in the corner, but you'll also be a part of the show! It'll make it feel really authentic, I think. For now just get comfortable with the new set up, um, you can check the security cameras over to your right with a click of that blue button. You can toggle between the hall cams and the vent cams...then over to your far left, you can flip up your maintenance panel. Use this to reboot any systems that may go offline. In trying to make the place feel vintage we may have overdone it a bit. Some of this equipment is barely functional! I wasn't joking about the fire—that's a real risk. The most important thing you'll want to watch for is the ventilation. Look, this place will give you the spooks, man, and if you let that ventilation go offline, then you'll start seeing some crazy stuff, man. Keep that air flowing. Okay, keep an eye on things, and we'll try to have something new for you tomorrow night. It's kind of silly, to be honest. There's no real reason you should be there for a whole five nights before the attraction opens. In this way, the game feels more forced than FNAF1 or FNAF2—there's not exactly a good reason to come back to this place so many nights in a row, or to stay from midnight till sunrise. But hey, that's the premise, so we gotta run with it. By the time skater dude is done explaining things to you, the first night is almost over. You don't actually get to mess around with the cameras, or the maintenance panel much. It's on the second night where things get real. On the second night, your employer tells you that they managed to find instructional tapes from the original Freddy Fazbear locations. So for authenticity's sake, he starts playing these tapes for you—and wouldn't you know it, they star phone guy! Phone guy is the man who talks to you every night in Five Nights 1 and 2, before your shift starts—he's the story vessel, essentially. That's sort of his role in FNAF3, as well. He tells you about how, originally, the animatronics doubled as robots AND suits—so people could wear the costumes. But, wearing the suit could be dangerous: if folks weren't careful, the suits could kill them. Because of course they could. Anyway, after he tells you this lore, you have to actually start playing the game. And this is where things get a little messy. If the animatronic is in a normal room, you can click on the "play audio" button, and a kid's laugh will play. This will repel the animatronic, should it happen to be standing in the same room you play the sound in. If the animatronic happens to be in a vent, you can shut down that vent, or a nearby vent, to make sure the animatronic doesn't make its way into your room. The longer you do this, the longer you can stave the animatronic off. Or at least, this is how I'm playing—I've seen people theorize that playing audio can also attract/lure the animatronic to its location, or make the animatronic come out of hiding. It doesn't always work for me. Here's the most detailed breakdown of the mechanics that I can find, but there's still some ambiguity. Sometimes, your audio, video, or ventilation can fail. The first two are self-explanatory—without audio, you can't hear when the animatronic is inching its way closer to you. And if your video fails, you can't see where the animatronic is. If your ventilation system fails, then the oxygen in your room gets cut off, and you become prone to seeing jump-scare hallucinations. These hallucinations are the original cast of Five Nights at Freddy's 1 and 2—so even though they're not actually in this game, the developer decided he was going to throw them at you anyway. So the whole "one animatronic" thing? Bunk. They're all here, and, well, it's kind of lame. The good news is that if an old animatronic jumps out at you, they can't actually kill you—they're not real, remember? Not that that helps with the shock of the jump scares or anything. Side note: How exactly are they going to open an attraction in a place where the air runs out all the time? Jesus. In any case, you can reboot the systems, but doing so takes time—which means that you can't monitor the cameras. It's the sort of system that almost seems like a distraction: I'm not sure if I should worry about the hallucinations, or if they're just a way the game distracts me from from the 'real' animatronic. The 'fake' animatronics jump out at me too though, so it's not like I can ignore them, either. But I'm not actually sure how to stop them! In effect, the ventilation system means that you experience waaaay more jump scares than the first two games—on any given night, I got at least 2 to 3 jump scares from the original cast. It makes the game more stressful, but it almost feels cheap. In the first two games, you could avoid jump scares if you played well. In three, it seems like you have to resign yourself to having jump scares all the time. Not only that, but after hours of playing the game, I'm not even sure why my character is there, or how he's supposed to deal with the monsters that come after him. The obtuseness of the mechanics doesn't feel like intentional design. Instead, it feels like the developer came up with a bunch of mechanics, like the vent thing, and the audio laugh thing, but didn't actually craft a story that could explain why these things exist, or how the player is supposed to use them. The result is frustrating—I've been stuck on night five for hours now, unsure of how to move forward, or what I'm doing wrong. I know horror is found in the unknown and all that, but playing Five Nights at Freddy's 3 feels stressful in a way that doesn't add to the experience. Don't get me wrong—there are certainly moments of FNAF 3 that are excellent. There is a window in front of your office, for example, where the animatronic will sometimes just...stare at you. Sometimes, it'll run by. And there's nothing you can do about it, except stare helplessly, and then get back to your cameras. There are also moments when a hallucination won't jump at you, and instead will come right up to your face until you shake it off. And out-of-context, I kind of love the idea that you're never really sure what's real and what's not. But there are just so many underexplained systems introduced in this game, that the design now feels bloated. FNAF 3 seems to have too many ideas going on at once. To top this all off, in the 3 hours I've played, the game has crashed 9 times, and it has more loading time than either of the first two games did, combined. Maybe that's just me, though. Have y'all experienced anything like this? And yet, I've stubbornly kept playing. The reason? I want to know what the heck happens. I want to know what's going on with the animatronic that's running around the facility. 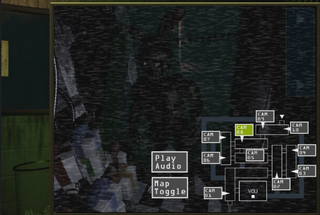 It just so happens that, in between every night that you survive, FNAF 3 throws a mini-game at you. These mini-games imply that someone actually died while using the animatronic suit—and that's why the animatronic is now haunted. It's also fascinating to hear the phone guy talk about the suits themselves—you start piecing together more of the story leading up to that moment. But none of this works toward making what you're actually playing seem exciting. Instead, it's something you have to tolerate to be rewarded with story bits that actually make Five Nights at Freddy's 1 and 2 more interesting. This is where the BIG spoilers start. Beware! There is a good ending, which you can see here. The YouTuber, DJ Sterf, says that in order to get it, you need to "beat the game after making all of the kids happy in the minigames," and if you manage this successfully, "you see a different end screen." If you want step-by-step instructions on how to get the good ending, check this guide out. Yup, sure looks like someone has died inside the suit. Cripes. Lots of people can't help but feel like this is it for the franchise. Mechanically, that would make sense—how much farther can Scott Cawthon, the developer, stretch this idea? How long until people get sick of FNAF? It already feels like he's losing the thread, given how messy FNAF 3 feels.